Every Tuesday, we’ll be bringing you short videos featuring some of your favorite bloggers, asking them about their “must-haves” for different life events. We’re calling this feature “Talk to Me Tuesday”. The goal is to lean on their experience in the hopes of improving your everyday living (the great part is, they don’t mind if you steal their secrets!). Bring one (or more) portable sackpacks to keep your belongings secured when walking around the theme park and on rides. Bring a lightweight jacket, especially if you stay until closing when the weather starts to get chillier. Bring a pair of sunglasses to protect your eyes while you’re standing in line for rides. Keep in mind, you can save (up to) an extra 20% off at Macys.com this week with code MOM. 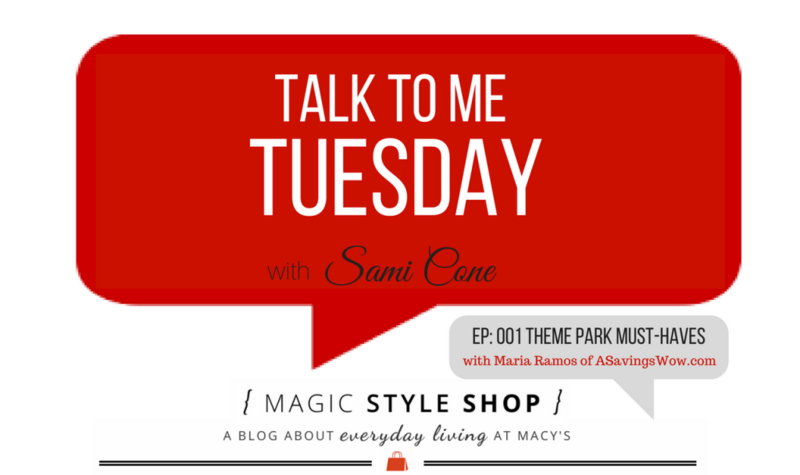 Come back next week for another episode of “Talk to Me Tuesday”!